What is our destiny? And perhaps more importantly... is there such a thing as "destiny"? These are the questions we wrestle with in The Adjustment Bureau, a political thriller with elements of romance, fantasy, theology, and science fiction thrown in for good measure. Matt Damon stars as David Norris, a young congressman who begins his rise through the political system but is quickly distracted by Elise (Emily Blunt), a mysterious woman he unexpectedly meets in the men's bathroom on election night. She so captivates Norris that, despite losing a Senate race, he actually becomes a new brand of politician - blunt, honest, and authentic - rare qualities that are destined to propel him to the Oval Office. But the original "plan" was that Elise was only supposed to be a temporary distraction on the way to Washington, not the woman of Norris' dreams. When another chance encounter pushes the two together again (and the "plan" goes completely off-course), the Adjustment Bureau steps in. We aren't exactly certain who the Bureau is, but if taken theologically, it seems that the film's writers believe that God (referred to as "The Chairman" throughout the movie) has position of predestination set for all people - and the Bureau's agents are messengers sent to assure that nothing deviates from the "plan." David Norris, it seems, has set his own course - not letting fate, predestination, or plans get in the way of his love. Christians have long argued about whether God has a grand plan for us - or if we are completely on our own, making it all up as we go forward. In Jeremiah, God tells the prophet, "Behold I know the plans I have for you" (Jer. 29:11), indicating that there is predestined script which has been hidden to us but completely known to God. Do we truly have free will or is it an illusion to make us appear that we have the power to control our lives? At one point in the film, one of the Bureau agents says that God has gone back and forth over the history of humanity - and whenever the divine powers let go, bad things happen (the Dark Ages, two World Wars, nuclear proliferation, etc.). Even when told this, Norris still refuses to go along. Even the temptation of knowing that he could become the President of the United States if he just consented (akin to the story of Jesus' temptation in the desert, as told in the gospels of Matthew, Mark, and Luke) - is not enough for Norris to divert from his path towards love. The emotional captivation and the growing feelings between David and Elise seem to be greater than all the power in the world and the direction of the fate of the universe. This speaks to the ultimate theology that love is the greatest power of all. In Paul's first letter to the Corinthians, he adamantly declares, "If I speak in human and angelic tongues, but do not have love, I am a resounding gong or clashing cymbal... If I give away everything I own and have over my life so that I can boast, but do not have love, I am nothing." (1 Cor. 13:1,3) David Norris seems to believe this. No matter how much power he could potentially have and no matter how close he could come to achieving his dreams, it is all for nothing if he cannot experience love. Questions about free will and destiny - whether they exist for us and if so, what our future holds and who can know it - are fascinating and theologically-stimulating. Some of us long for someone to lay out a script for us, pointing us in the right direction; others want to live on chance, trusting in their own power to make the best decisions in life. Perhaps the answer lies somewhere in the middle - where we cooperate with God, making our own choices, based on our free will, but listening attentively to the Lord's voice through prayer, teachers, conversations with others, and in the depths of our hearts and minds, grounded in morals, ethics, and unconditional love. So again, it comes back to love. When we wonder whether we are making the best choice for our lives, we need to ask ourselves, is this choice the most loving, kind, compassionate, forgiving, selfless, and generous one? If the answer is yes, then we are moving according to the best plan possible. If the answer is no, then we really are moving off-plan - and we might need to adjust our thinking, not by succumbing to a mysterious script policed by emotionless enforcers, but by humbly opening ourselves up to Christ-like love. We have been given free will, but films like The Adjustment Bureau challenge us to ask whether we are using it in the best possible way. The fantastic idea that God has to step in and control the universe when we abuse our gifts is theologically troubling, but it does cause us to do a little self-examination. God gives us free will not for our own desires, but so that we can be freed up to be the best versions of humanity that we can be. He gives this gift to us so that we can, in turn, give of ourselves to one another. Have the choices we have made this week been for the benefit of others or have they been for our gain alone? Have the decisions that have been made this week hurt others or helped others? Have they pushed the world closer to the Kingdom of God or farther from it? Questions like these are surely worth pondering. Theologians, philosophers, and academics can debate predestination and fate all they want. But for you and me, our concern for everyday life is how we make our daily choices and how much love and selflessness enters into that mix. These are the things that really matter - and if we live in a manner worthy of the Gospel, we won't ever have to worry about any adjustment bureaus or shadowy figures waiting to course-correct us. Let us pray we will all live in such a way, starting right now. I had zero interest in seeing this, but after your reflections, I may have to give in and rent it when it comes out. That said, I do have one challenge to one of your points. You make comparisons of Norris' refusing the temptation of being the president to that of Jesus refusing the temptation of the devil, opting instead to seek his "path towards love." You then cite 1 Cor 13, where Paul writes that if he doesn't have love, he has nothing. Personally, I think it's too much of a stretch to say that David Norris seeking after romantic love over his career is similar to what Paul is trying to convey in that passage. Paul is talking about a different kind of love, a love that finds its source in Christ, and then reaches out to all people. Romantic love falls within this love, as all forms of true love find their source in Christ. But I'm not sure you can say David Norris really captures what Paul is writing. As you said, love is the greatest power of all, and that is the ultimate theology. But, that's a very different thing from romantic love. John 15:13, "Greater love has no one than this: to lay down one’s life for one’s friends." That's the self-sacrificial love of Christ, to truly give up his life for all of us. That is the ultimate theology. Because our culture places such a high emphasis on romance, we tend to associate romantic love with Christ-like love, when really, I think Paul is talking more about our love for our neighbors. 1 Cor 13 is the most popular scripture read in weddings, but I think we cheapen his words by restricting that passage as "the wedding passage". Like many movies that have had allusions to some aspects of Christianity ('Book of Eli' comes to mind...), I think this one comes really close with some things, but still can be a tad misleading, especially with something our culture idolizes so much in romantic love. All that said...I think your reflections on free will and predestination are great, and very interesting. As you said, this movie definitely makes you think...how much control do we actually have? What does our free will look like? How do we express our free will? Good stuff. Thanks for the thought-provoking blog. Movies are by no means perfect analogies to theology, but they can point us in that direction. One area where film falls short of Scriptural and theological dimensions is the area of love. Romantic love is easy to portray on the silver screen whereas the love that God offers us is much more complex. My point in drawing a comparison was simply to talk about temptations that pull us away from the plan God has in store for us. For Norris, one of the plans (as far as we can tell) was for him to commit himself to a woman with whom he fell in love - and the other ambitions in life were temptations to follow more selfish, self-centered paths. I would agree with you, though, that Paul's description of love is more profound than romantic love - but I would challenge that, when we allow the love we have for one another (be that romantic, platonic, or otherwise) to be selfless and sacrificial, it is certainly a step in the direction of St. Paul's idea of perfect love. For many people, just taking those steps is a great way to start down the pathway to something even greater. Thanks again for your comments. I appreciate your thoughts. God bless! 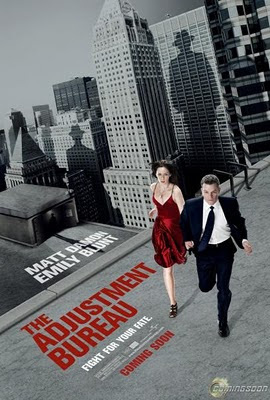 The first thing I can say is that The Adjustemente Bureau is a rare film. It starts as a thriller about an aspiring U.S. senator, only to be a courageous commitment to science fiction, when in reality it is a love story. A fantastic modern reissue requited love, but impossible to divine. When production starts to become a science fiction story is a bit messy and a bit mislead some characters, but once you become more or less with the leitmotif of the hat brigade, tension arises an intense thriller. An entertaining, unforseeable movie but something dense ultimately. It finishes almost without time, they do not give many answers.